- Key ring allows you to easily hook these flash disks on to any keychain,making it convenient to carry along! If there are any inquiry or questions, please do not hesitate to contact us. We will reply you in 24 hours and seek to achieve 100% in customer satisfaction. 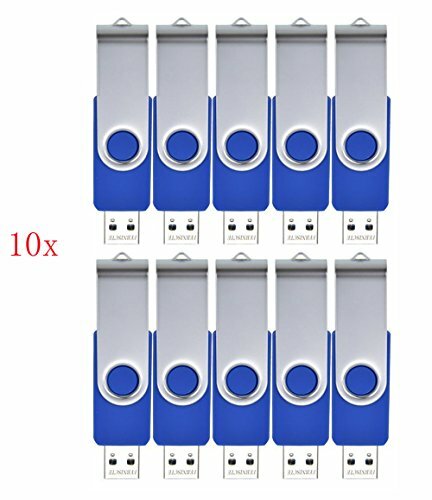 Compatibility- Flash drive pack is compatible with USB 2.0 and systems of Windows 7, Windows 8, Windows 10, Vista, XP, 2000, ME, NT Linux and Mac OS,etc. Convenience - Rotation metal side twist turn design for covering and protecting the USB end.Convenient for Data Storing and Transferring. Idealism - Fine choice for advertisement. The flat surface allow to print LOGO stickers or markers as gift for a promotion compaign. Note - 512MB usb stick is suitable for storing small files instead of big files. Please confirm the free space you need before buying.